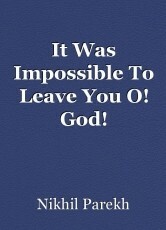 It Was Impossible To Leave You O! God! It was similarly impossible for me to leave my poetry and you O! Omnipotent God; ever dream of coming to this commercially mundane planet—who did nothing but ridicule my sensitivity; even once during the tenure of my romantically liberating lifetime.